My family has lived in the picturesque region of Connecticut that is East Hampton for years. When I was younger my family, and especially my grandfather, had told me stories about the many hauntings of the area. Many of these I could verify or look up more information about such as the Black Fox of Salmon River, Moodus Noises, vanishing hitchhiker of Cheshire, and others, but there is one story that I was never able to verify other than in person. 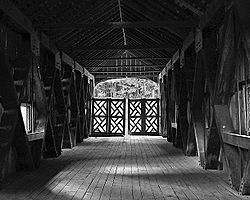 Apparently way back when the Comstock Covered Bridge was first built in the late 1870’s it was used quite a bit as the only way to travel between Colchester and Middletown (sadly, East Hampton was really just a town to pass though). It was a pretty popular place for teenagers to hang out during the late 1800’s as many of the travelers wouldn’t go through at night. If you go you will see all kinds of markings, initials and carvings that date from when the bridge was built to, probably, just a few days ago. The story says two such teenagers, whose names have been lost for years but may be located somewhere in the walls, went to the bridge and grew very much in love. The boy in the relationship continued to travel to the bridge to meet his love, but one night arrived to find only a note. She wrote to him saying, as many teenage girls do, she was no longer interested and didn’t want to meet him at the bridge anymore. In despair and anguish the boy continued to go to the bridge night after night, leaving letters for his love and hoping that he would see her there. His letters were never received and he never saw her again. Sadly, one night he ended his life by hanging himself off the bridge he had once enjoyed visiting so much. 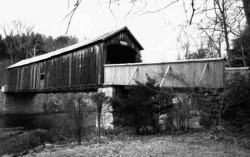 If you travel to the bridge at night it is said that you can hear the boy whisper “whhhyyyy?” to you if you look out one of the two windows located in the center of the wall. Some skeptics say it is probably the wind rushing through the double windows, but most who go to listen are convinced that the voice is there. Others have said they think they found the boy and girl's initials carved into the walls, though the exact location is not known.